Thanks to a blog I love (Smitten Kitchen), I found some great inspiration for dijon braised brussels sprouts. On Friday night I was out for dinner, and had the must luscious and buttery braised brussels sprouts I have ever tasted. This obviously re ignited my love for the sprouts, and last night I decided to make my own version of braised brussels sprouts. Brussels sprouts are a great winter side dish, they are often underused but a really great veg! They go as well as a side to many proteins and can be cooked in a variety of ways (blanched, fried, braised, roasted). 1. Cut the end off the brussels sprouts and halve lengthwise. 3. Add the shallots, salt and pepper. 4. Next add the wine and allow it to reduce off a bit. Then add in the stock. 5. Bring to a simmer, and reduce to medium-low heat. Cover the pan or pot with a lid (or tin foil) and allow them to braise for about 15-20 minutes or until they are fork tender. 6. Remove the sprouts from the pan, leaving the sauce behind. 7. Add the cream and simmer for a few minutes until the sauce has slightly thickened. Add in the mustard and adjust seasoning. 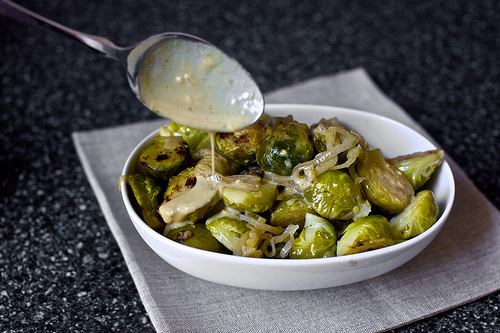 Pour sauce over the sprouts and sprinkle with parsley if using.